Unusual wear on R-comps - Miata Turbo Forum - Boost cars, acquire cats. I just removed my track tires after a two-day HPDE. I had noticed that the insides of all tires were wearing more quickly than the outsides, which is unusual (as far as I know). Even worse, the driver-side rear had corded on the inside (near the shoulder). These were slightly-oversized BF Gooodrich R1s (225/50-R15) on 9" 6ULs, leftovers from the 15x8 6ULSs I purchased for the street (on account of planning for 11.75" front brakes). The 225/45-R15 NT-01s I usually use exhibited what I consider normal wear - fairly even across the treadface, but ultimately more so on the outside because of the compromised camber I run on my dual-purpose street/track car. Any thoughts or suggestions? 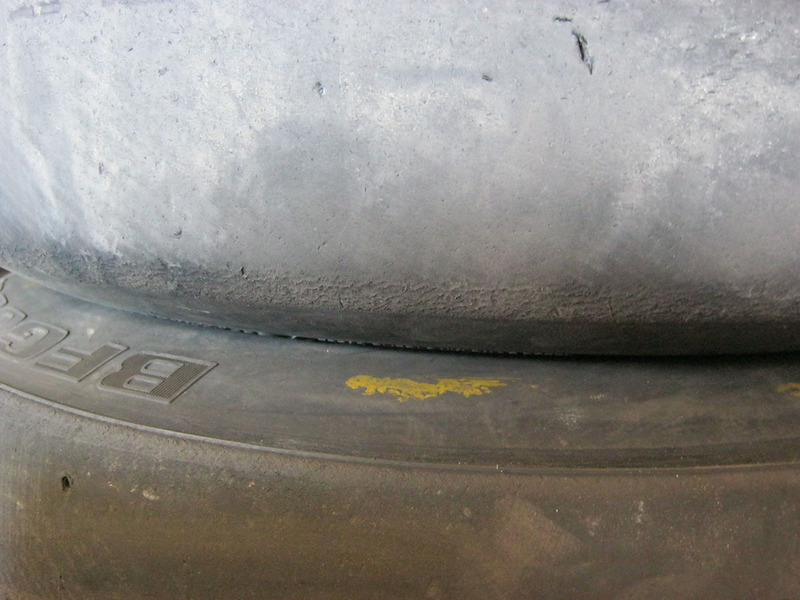 I'll be getting the alignment checked, of course, but this wear pattern is unusual enough that I thought I'd ask the gurus. Were the R1s new when you mounted them? 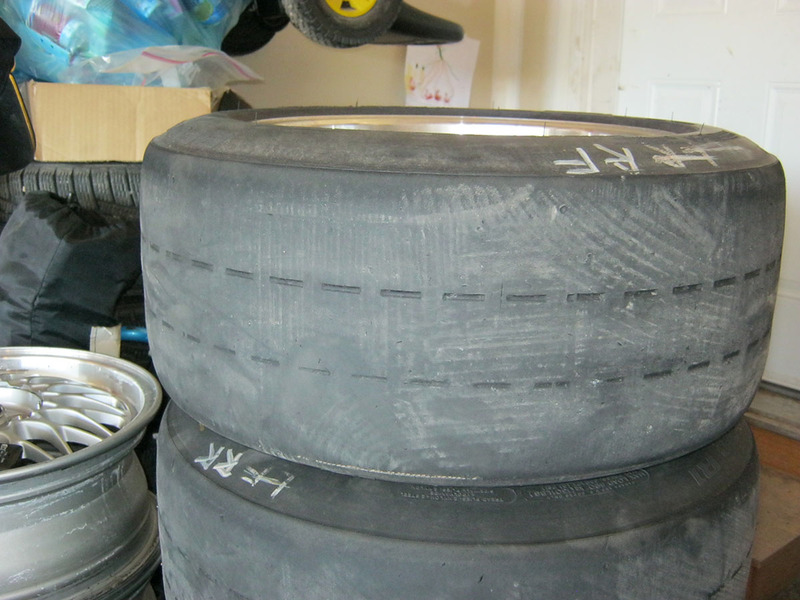 No, they were used, sporadically, by my brother for a couple of season's autocrossing (yes, wrong compound for that) and then stored in a clean, dry basement for a couple more years. I mounted them inside out, in the expectation that wear patterns would be normal. In that case, my guess is that your brother used up most of the tread on the outside edge. By flipping them you prolonged the life, but you didn't flip them early enough in the overall life of the tire to totally even them out. You could be right. However, when I took trackside readings, the tread temps were hotter on the inside and cooler on the outside, which jibes with the resulting wear. 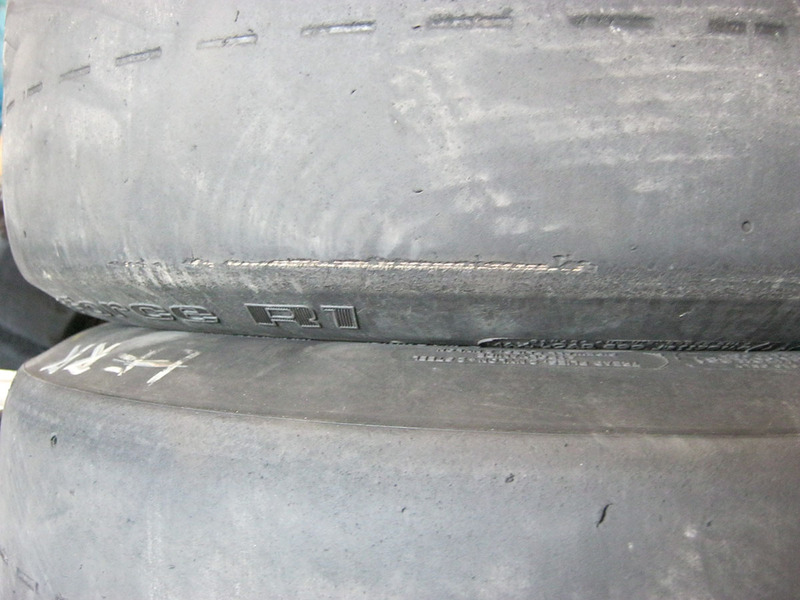 Could it be something about the construction of these tires that causes this? I read on another site that they tend to like less negative camber than other R-comps, but I'm only running about 1.5 degrees, not the 2.5+ degrees that more dedicated track cars can run. Could be the extra grip caused your eccentrics to slip? Perhaps your alignment is out of whack - that'd lead to severe wear. Maruha 10mm lift cams + Supertech SUB; lifter edge wear?